Sjoukje and concerns her personal impressions of this trip. I want to thank her for these 3 blogs. She saved me a lot of work. Next you can expect a blog written by me again, describing my backpacking trip in the north of the Philippines. is only about 50 km. wide here. We have some trouble getting out of the city, but once we find the right road we make good progress. The first part is quite flat and traversing the “backbone” of the peninsula does not really cause any problems either. These only start when we take the coastal road to the north and have to climb the by now well-known and occasionally annoyingly steep parts. After a bit of searching and asking for the right road, we find Fort Orantje, which our ancestors built here about 400 years ago. It is situated on a hill behind the formerly probably quite marshy coastal strip and has a wide view over the sea to all sides. The still standing exterior walls have been nicely restored and show that the fort itself was rather modest in size. On the map it is indicated as Benteng Oranje. A corruption of “vesting”, the Dutch word for fortress? A little further on we arrive at Hotel Panorama, which does justice to its name, though it could also do with a makeover. But the view is just as wide and beautiful as from the fort and that makes up for a lot. next goal, 300 km. away . But we did cycle 40 km. this morning and that means that as far as this trip is concerned, we have reached the magical limit of 1000 km. With help from the people that offer us their veranda for a well-earned rest with, we find a truck that goes our way. The bikes go on top of the cabin and we climb in. The driver is very careful, which of course is a good thing, but it does also mean that he does not exceed 25 km on an average per hour. We stop to drink coffee, a bit later to eat something and then again at a petrol station, which unfortunately has run out of diesel. We wait there for half an hour and it is now 9 pm and pitch dark. By and by the driver begins to understood that there is only one way to get rid of us. So he gets back in behind the wheel and drives on until we see the sign of a hotel at 10.30 pm. He happy, we happy. But all this has brought us only 130 km. closer to Tomahon. In good spirits we continue the next day. The road finally looks the way our cycling (very special for a resident of this country) host in Gorontola said it would be: a lovely undulating route through a beautiful green landscape with coconut and banana plantations. We are now in the middle of Minahasa, the most “Dutchified”; region of the whole of Indonesia. In the middle of the 19th century almost the entire population was converted to Christianity and in the schools Dutch was the main language. With this in mind, we do not expect to see too many mosques any more, but we are surprised to see how many there are here also, even though the churches are in the majority. And they cannot be missed! It seems that there is an architectural religious war raging, not only between the different faiths, but between mosques and churches among themselves. Fantastic sugar pies, golden domes, stained glass windows, the most kitschy decorations and unmissable colors. And all this in often quite small villages / towns. Where do they get the money? Later we learn that it is the people in the congregation themselves who pay, convinced that the more impressive the church is, the better God hears you. The good, scenic road and our now pretty good condition make it possible for us to reach Amurang, almost 100 km. away, in one single day. There is a beautiful Dutch-run homestay here with delicious food and a swimming pool, an appropriate reward for the day’s performance. When we tell our host that we are amazed at the large number of churches that we have seen along the way, he tells us that along the 5 km. boulevard on the way to the homestay there are 15 of them. We had spotted a few of them, but 3 per kilometer? The next day we go back into the mountains, towards Tomohon. The first 30 km. we take a mikrolet (small van), but then the legs have to start working again. Tomohon is a small town surrounded by volcanoes, known for its market, where dogs, cats, flying foxes and snakes (pythons) are also offered in the meat department. It is Sunday, market day, and we see that this is indeed the case. Even worse than the bats of Tentena? By now the rainy season is beginning to start and that means that many hiking trails are muddy and not easy to climb. We choose therefore to climb a volcano with a paved road to just below the summit. With our light bicycles without luggage (which a friendly optician lets us park behind his shop) we make it to about half way. But then the road becomes so steep that even Bert has to get off and we decide to leave the bikes in a reasonably safe spot behind some bushes and to do the last 2 1/2 km. on foot. The rain is gently falling, the tropical forest glistens wetly and the low-hanging clouds create a beautiful atmosphere. Then a long stone staircase and finally we stand on the edge of the invisible crater. On the way back the weather becomes clearer and we can take some good pictures. name. But first we fortify ourselves with a nice bapao before we drive out of town at 16.00 hrs. It is a bit late, but it is not a difficult road, because it goes mostly down. What is difficult though, is finding a place to sleep when we arrive. Our first choice (from the Lonely Planet) does not seem to exist (anymore?) and at the second one the lady says they are full, though we do not see any guests. By then only the last option is left, an ugly, poorly maintained building that is not even remotely attractive inside or out. But it is now quite dark and we are happy to have a place to sleep at all. The nice and cozy restaurant across the road makes up for it . Incidentally, when we entered Tondano, we were very surprised to see statues of what appeared to be two VOC dignitaries in the middle of the roundabout. Unfortunately, we could not analyze the text on the pedestal. It is now Monday, November 5, the weather is good and we start this day with a very relaxed tour around the lake without luggage. Holiday time! The landscape reminds us of the Italian lakes, albeit that the mountains here are volcanoes. But it is beautiful! Everywhere you can see how people make use of the lake by growing vegetables and building fish ponds. On the way we pass several villages and about halfway we are invited for lunch. A dozen men, all members of one big family, are busy painting the church opposite the house (because Christmas is coming) and have just stopped to have lunch. Fun and tasty and yet another proof of the great hospitality of the people here. But we have to continue, because today we want to reach Manado, from where the boat leaves for the island of Bunaken. We pick up our luggage and start the wonderful descent to sea-level with beautiful views now and then, despite the sometimes threatening gray sky and low-hanging clouds in the background. We find a nice guesthouse and eat some delicious saté later that evening in a restaurant that is recommended in the Lonely Planet. 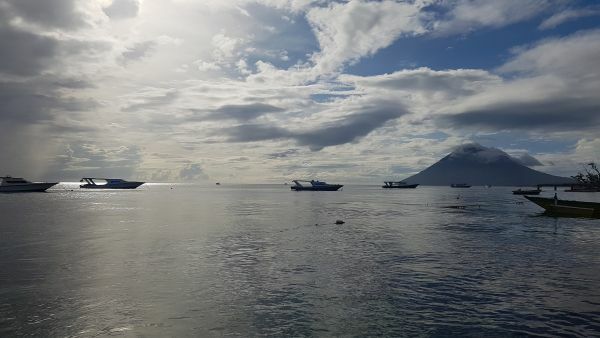 Bert wants to stay in Manado for another night, but I feel like going on to Bunaken, the diving and snorkeling paradise, which is only a short hour away by boat from the coast to the north-west of the city. It is an island of about 8 x 1.5 km, surrounded on all sides by reefs. Near it, separated by a narrow sea-channel is an island with a volcano, with the classic cloud plume at the top. After arrival I cycle slowly along the only road on Bunaken to see what the best place is to settle down. When I pass “Franky’s Homestay”, I am greeted with a wave and a smile: all the people sitting on the porch I have met before. There is no room left, but a French girl invites me to share her big double room with two large beds. It is not only a very cozy place, but also serves delicious meals 3 times a day. I originally planned to stay here only three nights and to use the last day and a half of my stay in Sulawesi to go to a nature reserve 50 km. east of Manado, but drop that plan very quickly in favor of five days with a very nice group of people, lazing in the hammock, eating delicious food, snorkeling and playing a game of cards in the evening. dolphins to go around, at least 150 of them. One morning it rains and when it gets dry after lunch I decide to explore the island by bicycle. The non – tourist part has a different atmosphere. The houses are further apart, cows are walking around here and there, and I have to watch out for the small, mostly black, pigs that run around. The adult animals are not big, size small Dutch piglet, and the little ones are really cute miniatures. Bunaken is not large and has about 7,000 inhabitants, but still boasts two churches, the big one like a small white cathedral, and one mosque. Tomorrow is Sunday and I really have to leave to get the plane to Bali on Monday. After an extra day in Manado to ”slow down’, I take the boat to the island of Bunaken where I do not only meet Sjoukje again, but also a number of travelers that we have met earlier on the Togean Islands. A nice crowd. With some of them I make some wonderful day and night dives. An unforgettable experience. Turtles, whitetip sharks and immense schools of fish, but also unknown creatures such as the small urangutang crab and some nudibranches. What a beautiful underwater world! a last 10 days before returning to the Netherlands. I have a few days left to visit the Tangkoko nature reserve northeast of Manado. The area is known for its tarsiers (tarsiers), small hamster-sized woolly animals with eyes like marbles that become active at night. Cute little creatures. Except in Sulawesi they also occur in the Philippines, but there they are larger. The area also houses several families of black macaques, hornbills and the bear couscous (a marsupial that lives in trees). An enthusiastic guide knows how to track and find all of them for me. Especially the macaques can be approached fairly easily, which makes for nice pictures. After one day I have to leave the area unfortunately to get to Manado airport in time for the plane that takes me to Bali. I go to Kuta to stay in a hostel that is close to the airport of Denpasar. Although it is the busiest and most touristic part of Bali, I choose this place deliberately for an easy departure to the Philippines a few days later and also I can leave my bike here for a long period of time. And for just a few nights I can put up with the deafening discostampers from the pubs a few streets away. Later I will come back to visit the interior of Bali. want to apply for another visa, so that I can travel in Indonesia for 2 months more.